Tapestry subjects ranged from the mythological and religious to the decorative, allegorical and heraldic. The scenes in this series may have appealed to Henry VIII (1491–1547) because of his own political concerns. Taken from the biblical book of Genesis, the panels include God's appearance to Abraham to establish a covenant of blessing. Henry might have referred to this to strengthen his own claim to God-given rule after the Break with Rome in the 1530s. The circumcision of Abraham's long-awaited son, Isaac, would also have resonated with the king's increasingly desperate attempts to provide a male heir. The Royal Collection set is woven in expensive gilt thread, which suggests that it was commissioned by Henry himself. During the king's lifetime the tapestries were hung at Hampton Court Palace, and when the series was valued by the Interregnum government 100 years later, it was priced at £8260. 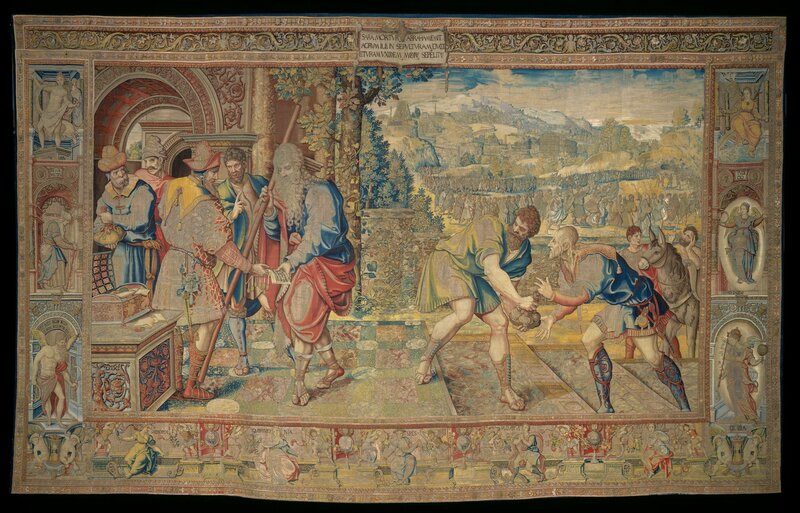 This astonishing sum was far greater than for any other work of art, highlighting the elevated position occupied by tapestries in this period. Panels from the series were hung in Westminster Abbey for the coronations of Elizabeth I, in 1559, and the Stuart monarchs in the seventeenth century. Under William III (1650-1702), some of the series furnished the new king's apartments. The fact that tapestries 150 years old, rather than a newly commissioned set, were used for the King's Bedchamber clearly indicates their continued magnificence and power as emblems of the Tudor dynasty.